I am from ITALY and moved here 4 years and 1/2 ago from LONDON UK. I was missing my family and decided to adopt a dog. After speaking to few people I decided to adopt from a shelter instead of Buying a pet. I saw Ulisse's Picture and I thought he was the cutest baby in the universe. I called the shelter and put an hold. As the system was down they could not. When I called the 4th time they said someone else got him. I made a complaint as I was the first caller and I wanted him so bad. In the last two months, I called every single day for all the shih tzuS they had, but I could never get one. I then, that day, spoek to the supervisor and she agreed that if the system was not down, I would have put on hold My baby. So she gave him to me. I had never been in LA but I printed the directions and, for my first time, drove all the way by myself after work to pick up my babyboy Ulisse. He was in terrible condition but as I never had a dog, I did not realize that Until I brought him to the vet. He had pneumonia, ear infection, tape worm and he was also infected with fleas and his skin was in such a mess. He cost more than 12 hundreds dollars to cure him the first months. He deserved every single penny I spent on him. After 4 years you could not recognize him, he is an happy camper, always smiling and more secure in himself. He was so scared at the beginning, but after sleeping for a bit with mum he start knowing that mum will never maltreat him or abandon him. He has now a sister, Penelope, from SD shelter and a brother, Telemaco, who was given to me by his owner who could not keep him. 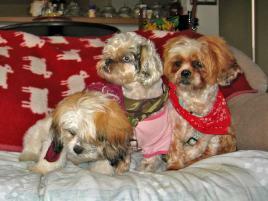 I am the luckiest ITALIAN WOMAN IN THE WORLD as I met the LOVE OF MY LIFE IN THE USA ( my 3 shih tzu are MY CUTEODYSSEY).